This case involves removing tooth #7 and placing an immediate implant. A key to success for immediate loading is the preservation of bone and gingival architecture during the tooth extraction. The EZ Extract system helps to accomplish this by elevating the tooth vertically out of its tooth socket, as opposed to lateral elevation. Lateral elevation can cause bony plate fractures as well as gingival lacerations. 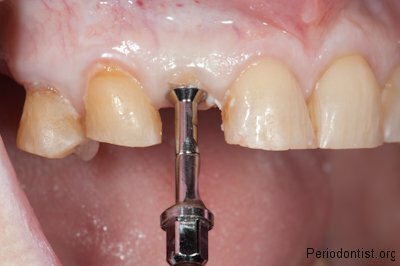 This technique involves shaving the tooth down to create a flat platform. A screw is placed inside the root canal of the tooth. A tray with some impression material is placed over the screw. The impression material acts as a cushion to the adjacent teeth. The tooth removal tool has beaks that are spread apart by a dial at the end of the tool. One side of the beak engages the top of the screw while the other beak engages the tray. As the beaks are spread apart, a vertical force is created that lifts the tooth root out of its socket. In this case there was no trauma to the gingiva or bony socket so we were able to place a simultaneous implant. A healing abutment was placed over the implant to help maintain the gingival architecture during the healing process. 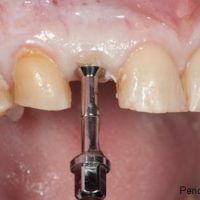 what is price the Tooth removal Extract system? I am not sure, I believe it was less than two thousand dollars. There are some newer systems on the market now that dont require the impression portion.